. : Optics & Photonics Focus :: From Fascination to Reality :. Tiny particles in the atmosphere play a decisive role in determining the Earth’s temperature. Can nanoparticles be deployed to fight global warming? Mirror, mirror on the wall, who is the bluest of them all? The Fairy Penguin, of course! A newly discovered biophotonic structure causes the blue shades in the feathers of the penguins found along the coastline of Southern Australia and New Zealand. A deep fascination with the flight of birds inspired the invention of the airplane. A deep fascination with the stars inspired the invention of the telescope. What will fascination with metamaterials inspire? A view through a METATOY. A sheet covered with tiny Dove prisms acts almost like a homogeneous surface and mimicks negative refraction in metamaterials. Here, a straight line perpendicular to the sheet appears bent into a hyperbola. Everybody starts out as a scientist. Every child has the scientist's sense of wonder and awe, the American science writer Carl Edward Sagan once said. Does a small curious child, however, live inside every scientist? This much certainly is true for Alasdair Hamilton and Johannes Courtial at the University of Glasgow (Scotland, UK) who first proposed and demonstrated the concept of METATOYs: new materials born in the researchers’ attempt to transfer their own deep fascination with metamaterials to the macroscopic scale. "We decided to name our materials METATOYs, a shoehorned acronym that stands for metamaterials for ray optics," Courtial says. "In addition to analogies with metamaterials, this acronym also expresses the fun we were having working on this project." METATOYs are macroscopic materials made of standard optical elements, such as Dove prisms and confocal lenslets, which display exotic optical properties, similar to metamaterials. "A few years ago I was fascinated by metamaterials," Courtial explains, "especially how they can be seen simply as a volume filled with lots of tiny electro-magnetic circuits that then act like a homogeneous material with bizarre optical properties. The first of these optical properties I heard about was negative refraction. I was wondering whether it would be possible to do anything interesting with tiny everyday optical components." The first test performed using Dove prisms was successful. A surface covered with tiny Dove prisms was indeed acting almost like a homogeneous surface — the smaller the Dove prisms, the more homogeneous the surface — and mimicking negative refraction in metamaterials. More work followed: arrays of confocal lenslets with different focal lengths, for example, worked approximately like the interface between optical media with different refractive indices; in principle, different combinations of focal lengths such as confocal lenslet arrays could simulate any refractive-index ratio. Quite surprisingly, METATOYs seem to work exactly like a kind of macroscopic metamaterials, but, as Hamilton says, "METATOYs are not metamaterials in the traditional sense." There is a fundamental difference between metamaterials and METATOYs. Metamaterials are manmade materials whose fundamental unit is a very small electric circuit, much smaller than the wavelength it is designed for. In this approximation, light, or another electromagnetic wave, propagates in it as it would in a homogeneous material with very bizarre optical properties. Since the fundamental unit in METATOYs is a standard optical component, it is much bigger than any wavelength of light. "John, Alasdair and I spent a lot of time simulating our systems using ray-tracing software, confirming our experimental results," Courtial points out. "However, wave-optically, this analysis clearly cannot be right: an array of very small components would act like some form of grating, so diffraction would have to play a major role. This means that METATOYs can never work perfectly but only in first approximation." The researchers at the University of Glasgow, therefore, know that metamaterials and METATOYs are connected by something more than analogy. "The effect of METATOYs can, of course, be described wave-optically, perfectly in accordance with Maxwell's equations," Courtial explains. "Wave-optically, their principle of operation is perhaps best described as a pixilated wave-front modification with discontinuities in between the constitutive parts instead of a truly local modification of the wave front like in metamaterials. Visually, however, this is indistinguishable from the truly local modification." Visually? This is not too all that surprising as that is how a computer monitor works: in so far as we cannot distinguish the individual pixels, the image on the monitor looks homogeneous. Just like a computer monitor displays images pixilated, a METATOY changes transmitted light into small chunks. The pixels of a computer monitor cannot be seen by an observer from an appropriate viewing distance; likewise, light changed into small chunks by METATOYs cannot be seen from the appropriate viewing distance. "By using this compromise," Courtial adds, "METATOYs can perform light-ray changes that cannot be performed perfectly, and which, to the best of our knowledge, have therefore never been considered before." What could be the main application for METATOYs? Hamilton comments that "what we currently find really exciting about METATOYs is that they are able to realize really unusual forms of imaging. 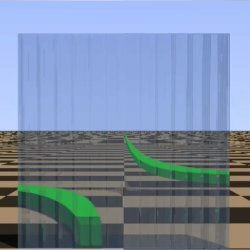 We are, for example, currently simulating a camera that can focus on arbitrarily-shaped surfaces, and not just planes (like a normal camera lens). METATOYs can then, of course, be used to communicate the key effects of metamaterials at a more accessible length scale." Gordon Love at Durham University (Durham, UK) mainly agrees: "I suspect there could be a large number of applications, and, as in the case of all good science, I think the best ones cannot really be predicted now. Nevertheless, possible ones include imaging devices, projection devices and displays. More importantly, I believe, they will be very interesting 'toys'. And I do not mean that in a demeaning way - but they will be able to demonstrate interesting optical effects in a very simple and accessible way." There is a huge amount of interest in metamaterials at the moment, and it is partially justified by the fascination they evoke, in promising, for example, working invisibility cloaks. On this, Love comments: "In my opinion we are a long way off still making large-scale cloaking devices which could ‘cloak’ everyday objects, such as people - but such ideas clearly catch the public's imagination. This is where METATOYS come in. By using carefully arranged arrays of conventional optics, Dr. Courtial has shown that you can make optical components that simulate metamaterials. It is important to note that in no way are METATOYS real metamaterials, despite the fact that they do display similar interesting effects. I should say that the beauty in Dr. Courtial's work on METATOYS is that it is based on rather simple basic optics - but it is put together in an elegant and subtle way to produce some unexpected results." In other words, great ideas mostly stem from thinking outside the box. Alasdair C. Hamilton, Bhuvanesh Sundar, John Nelson, and Johannes Courtial, Local light-ray rotation, Journal of Optics A: Pure and Applied Optics (2009) 11, 085705 (link). Alasdair C Hamilton and Johannes Courtial, Metamaterials for light rays: ray optics without wave-optical analog in the ray-optics limit, New Journal of Physics (2009) 11, 013042 (link). In the video,a straight line appears to bent into a hyperbola when viewed through a METATOY sheet.